The West Regional is the only one in this year's NCAA tournament in which all of the top four seeds—No. 1 Oregon, No. 2 Oklahoma, No. 3 Texas A&M and No. 4 Duke—have reached the Sweet 16. Which one will head to the Final Four? Oregon had arguably the most dominant performance of any No. 1 seed in the first round of the tournament, dismantling Holy Cross with a 39-point win in which nine different Ducks scored, four of whom finished in double figures. Of course, they faced a more difficult challenge in their second-round game against St. Joseph’s. After leading by five points at the half, Oregon fell into a seven-point deficit with 4:49 left to go. But from there the Ducks played like the No. 1 seed the Selection Committee (if not too many other people) believed that they were, going on an 18–6 run the rest of the way for a 69–64 win. There is still some cause to doubt the Ducks, though, and not just because they are the only one of the seven Pac-12 teams that made the tournament still alive. Despite being a No. 1, they are the sixth-best team remaining in the country in adjusted efficiency, according to kenpom.com. Ahead of them are the other three No. 1 seeds as well as Villanova (South No. 2), Oklahoma (West No. 2) and Miami (South No. 3). What holds Oregon back is its No. 43 defense, but it did prove potent down the stretch against St. Joseph’s, which had the No. 27 ranked offense on kenpom.com. Oregon matches up nicely against a Duke team that struggles to guard (110th in defensive efficiency) in the Sweet 16. The Ducks’ depth and variety of offensive weapons will make them a threat in every game until—or if—they’re eliminated. Riding a season-best 10-game winning streak now, Oregon seems to be playing its best basketball at the right time. 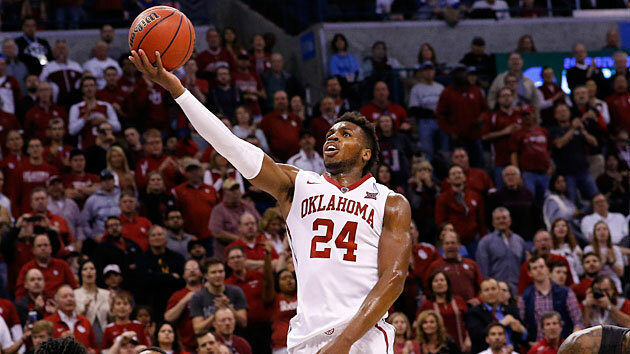 Did you catch the Buddy Hield Show in the second half of the Sooners’ 85–81 second-round win over VCU? If not, head to your nearest television or streaming device and enjoy the replay. Hield scored 36 points in the game, and 29 of them came in the second half as VCU mounted a furious comeback from a 13-point halftime deficit. With Michigan State’s Denzel Valentine out of the NCAA tournament, Hield is unquestionably the best college basketball player left in the Big Dance. The Sooners’ balance would be difficult for Oregon to match up with in a potential Elite Eight showdown. They are 14th in offensive efficiency and 18th in defensive efficiency, meaning that they can score with the Ducks but defend significantly better. It’s easier to take defense on the road, which would give Oklahoma a neutral-court advantage. And in the NCAA tournament, where wins and losses often come down to having the best player on the court, the Sooners know they have the No. 1 advantage in Buddy Love every single game. We're probably witnessing the final games of Ingram's brief college career. The spectacular freshman forward is the projected No. 1 or No. 2 pick in June's NBA draft. But unlike the player he's competing with for the top spot—LSU freshman forward Ben Simmons—Ingram and his Blue Devils are dancing. As a team, Duke showed its youth and vulnerability in struggling to put away UNC-Wilmington in the first round and nearly blowing a 27-point lead against Yale in its second round victory. But Ingram has been consistently excellent, scoring 20 points against the Seahawks and 25 points against the Bulldogs. There may not be a more motivated player in the NCAA tournament. Everyone is out to win a national championship, but only Ingram has a real shot at the top prize in the NBA draft. Savor his last few college games. What the Aggies did in their epic comeback victory against Northern Iowa on Sunday had never been done in the history of college basketball. Just consider that for a moment. There are 351 teams that play between 30 and 40 games every season, and never once before had a team been down by 12 points in the final minute and come back to win. And the Aggies didn’t even need the whole final minute. They started their comeback with 38 seconds left on the clock and had the game tied by regulation and won two overtimes later. ​​It is unlikely that they’d be able to pull off another comeback even close to that against Oklahoma (which has successfully inbounded the ball on many late-game occasions this year, something it didn't appear UNI had ever done), but think of Texas A&M’s confidence now. Even if the Aggies are down by a significant margin with 10 minutes to go, or five minutes to go, or two minutes to go, they will not give up because they know now that they can get back. This team will not be an easy out at any point in the NCAA tournament. The Ducks and Sooners will battle in a high-scoring affair that ultimately ends with Buddy Hield in the Final Four as the West region’s most outstanding player.